A new 175-room Westin hotel will open in mid-2019 at Lighthouse Point. ST. GEORGE — A luxurious $100 million Westin hotel is being built to house tourists drawn to Staten Island. The 175-room accommodation will be part of the $231 million Lighthouse Point project on the borough's waterfront, the developers announced Monday. Triangle Equities partnered with Starwood Hotels & Resorts to bring the 190,000 square-foot facility to the project, dubbed Westin New York Staten Island. "Nowhere else on Staten Island will you find a full-service hotel with first-class amenities and stunning unobstructed views of the New York skyline to accommodate both business and leisure travel," Lester Petracca, president of Triangle Equities, said in a statement. The hotel, which developers describe as a "business-friendly upper-upscale hotel," will be designed by Perkins Eastman and Andres Escobar and have 15,000 square-feet of event space. It's expected to open in mid-2019. After nearly a decade of planning, Lighthouse Point broke ground in June to take over a former U.S. Coast Guard base next to the St. George Ferry Terminal with 115 residential units, a parking garage and a public plaza. The first phase of the development, which also includes co-working space by Regus and nearly 30,000 square-feet of retail space, is expected to be finished by 2018. 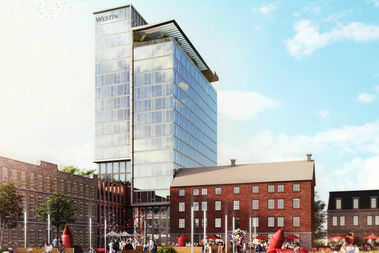 The hotel is part of the second phase of the development which also includes renovations of six historic buildings for a mix of retail spaces and restaurants. The area is the site of major new developments including the New York Wheel, one of the world's tallest Ferris wheels, and the city's only outlet mall. The project was announced in 2006 after developers won an RFP to build on the site, but hit several snags along the way and was almost derailed last year when the state put a hold on $16.5 million in subsidies that had been proposed by Gov. Andrew Cuomo. In February, Assemblyman Matthew Titone and Michael Cusick announced that the funds — including a $15 million convertible loan from New York Works Capital Fund — were approved and developers secured the rest needed from 12 different sources.